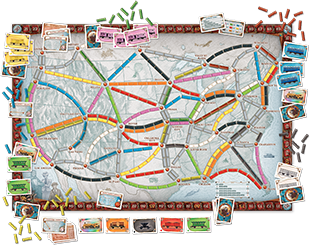 I love route building games and I love railroads so my goal with Ticket to Ride was to design a game that combined those two things in the simplest way possible, while retaining a game that was fun to play no matter how many times you played it. I also wanted the emphasis to be on building routes from coast to coast. People often ask me if I knew the game would be a hit. But if I’d known that, I would have designed it twenty years earlier. Ticket to Ride – USA 1910 is a card expansion for the original Ticket to Ride board game. It consists of 181 new large format cards (the same size as Ticket to Ride Europe), that include: 35 new Destination Tickets, a new GlobeTrotter bonus card for completing the most tickets, plus a complete replacement deck of all the cards from the original game deck. 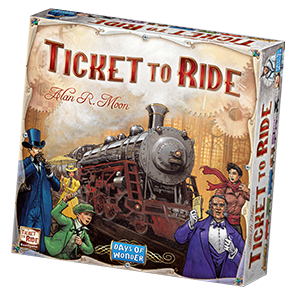 Also included is a new rulebook that gives Ticket to Ride players three new ways to play the game including 1910 rules – games using only the new Destination Tickets; the Mega Game, featuring all the tickets; and Big Cities, which uses only tickets to certain large cities. The USA 1910 cards and rules variants will really change your strategies and tactics when you play Ticket to Ride. They will surprise even long-time veteran railroaders and bring hundreds of hours of new fun to your family and friends. So hop on board and discover… a whole new ride with Ticket to Ride – USA 1910! 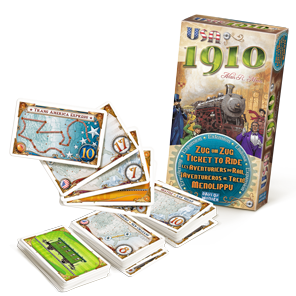 USA 1910 is an expansion for the Ticket to Ride boardgame, not a stand-alone game. An original copy of Ticket to Ride is required to play. Game play is very tight, and I found that game scores can run very close – making for an exciting game, all the way down to the finish. 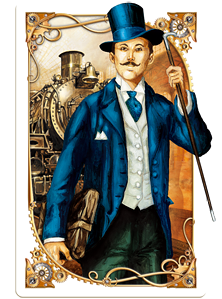 I feel safe in saying that Ticket to Ride is an absolutely superb game and is highly recommended. Ticket to Ride is a fantastic family game because it is easy to learn, plays fairly quickly, and appeals to players of all ages – both kids and adults will have fun trying to become the next railroad baron… All things considered, Ticket to Ride is definitely the top game of 2004 for families and casual gamers alike.